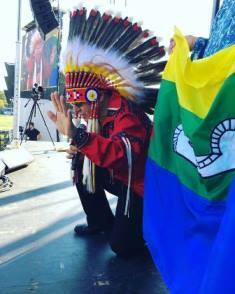 WASHINGTON, DC (ANS – October 3, 2017) — When Native Indian tribes from the United States, Canada and around the globe return to Washington D.C. this fall, they believe the glory of God is returning with them. On October 20, 2017, First Nations people will fill Constitution Hall – for the first time in American history – for their Second Annual National Day of Prayer. The presence of God is coming with them like the forgiveness they brought to the nation’s capital last year, when tribes from the U.S., Canada and the world gathered at the Washington Monument for the inaugural Day of Prayer By First Nations on October 21, 2017. Envisioned by an Euchee (Yuchi) Indian, Dr. Negiel Bigpond, First Nations prayer and worship on the National Mall was heard inside the White House, which acknowledged by telephone the presence of about 75 different Native American and Canadian tribes in D.C. In the shadow of the monument’s standing, granite rock, tribes erected teepees, beat drums, danced, prayed, worshiped and, very intentionally, extended forgiveness to the nation for breaking treaties with Native American Indians. “Last year we extended forgiveness to a nation that never asked for it; this year we’re releasing the glory of God back over America and the nations,” said Willie Jock at a rally in Denver on Saturday. An Akwesasne Mohawk, Jock read the prayer he authored, “The Power to Forgive,” at the base of the Washington Monument. “As the host people of Turtle Island, we forgive every atrocity and broken covenant ever designed to destroy us as a race of people,” Jock said in Washington D.C.
Days later, Jock authored “The Prayer of the Peacemaker,” which he recited at the Standing Rock Reservation in North and South Dakota beside Dr. Bigpond, Lakota Sioux Gabrielle Medicine Eagle and Chickasaw Randy Wade. “We stand beneath the outstretched branches of the great tree of peace and invite all nations to join us as we cry out for the master of life to bring His justice, unity, and peace over Standing Rock and all of the Americas,” Jock said. 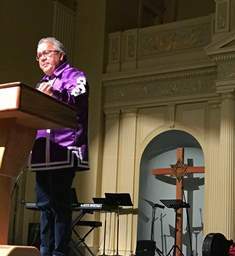 Jock, Eagle, Wade and other members of All Tribes D.C., the sponsor of the annual Day of Prayer By First Nations, spoke Friday night and all day Saturday in Denver at Church in the City/Beth Abraham during a vision rally that brought together Christians, messianic and indigenous believers in Jesus Christ. The church is the former home of a Jewish synagogue and later an Indian center. Between the rally in Denver and the day of prayer, Jock and some members of All Tribes D.C. will visit Israel from Oct. 9-13, when messianic Jewish believers will impart through prayer the glory of God to Indian leaders before they travel to the nation’s capital. “I believe it’s going to begin on October 20th as the First Nations people release the glory of God over America and the world,” Jock said. Jock and other First Nations Leaders agree with the words of Dr. Billy Graham. 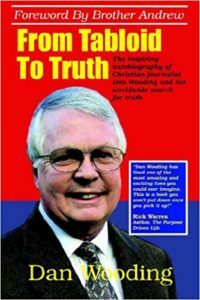 Some Christians groups – All Tribes D.C among them – recognize the accuracy of a deceased prophet who declared 2017 a turn-around year and one of (God’s) favor. It’s a year of God’s awakening the nations and the return of His glory, according to the late prophet Bob Jones. “Watch this year as the nations of the world come alive in the holiness of the Father, the love of Jesus and the power of the Holy Spirit,” Jones prophesied before his death. A website containing other prophecies spoken by Jones is maintained by his wife Bonnie. Jock’s prayer produced peace of mind and heart even though the events at Standing Rock, where water and burials sites remain contentious issues, didn’t go the way Chickasaw leader Wade hoped they would. The gatherings in Israel and D.C this year will have shifting effects on the nations as forgiveness in America did in 2016. Ojibway Cree Mary Faus, who earlier this year was invited to speak at the National Press Club on behalf of Dr. Bigpond at a church conference she attended, agreed a shift took place in the nation in 2016, and she expects another this fall. At the rally in Denver, Faus said, “The sound that’s going forth is shaking the very ground that was used to bury our people. “The Word Himself is coming alive in the Native Bride. 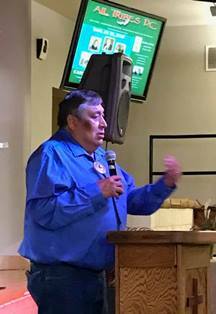 “The very acts used to shame and humiliate her will be her greatest weapon to undermine the accuser,” said Faus, who was chosen by All Tribes leader to emcee inside Constitution Hall on October 20th. Lakota Sioux Gabrielle Medicine Eagle said prayers of forgiveness and peace bring God’s glory and presence. He knows from personal experience, forgiving “white people” for the first time when he came to faith in the Lord Jesus Christ in 1984. 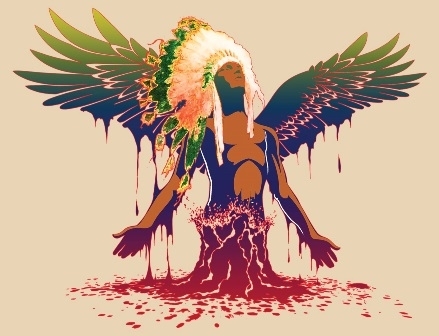 Before his conversion, Eagle was dismayed by the Department of Interior’s handling of Indian reservations, sending youth to residential schools – both parochial and public – which sought to strip them of their cultural identities. “God has turned around the word reservation – meaning set aside – for His use. He is restoring our governmental authority,” Gabrielle Medicine Eagle said. Potawatomi Martha Schmitt, who works with Dr. Bigpond at Two Rivers Native American Training Center near Tulsa, Oklahoma, expects members of more than 75 tribes will attend the prayer event on Oct. 20. Bigpond first envisioned a national day of prayer for First Nations in June of 2016, reserving area around the Washington Monument with the U.S. Park Service a few months later. There are approximately 500 tribes in U.S and 500 more in Canada. 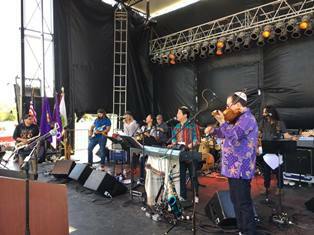 Seventy-five tribes prayed on the National Mall last year, and more are expected this year, Schmitt said. Also in Denver, Navajo leader Ellson Bennett and his adopted South Korean daughter, Callie, spoke and led worship, respectively. Callie is in the running for two Native Music Awards: Best Female Artist of the Year and Best Gospel Inspirational Record. Representatives from government, education and the church – three of seven mountains of influence – are invited to the day of prayer. Among the invited high-profile speakers are Kansas Governor Sam Brownback and Senator Stewart Greenleaf from Pennsylvania. Author, speaker and internationally recognized prayer leader Chuck Pierce will represent the church in D.C.
Photo captions: 1) Chief Harvey Yesno in prayer. 2) Dr. Negiel Bigpond.3) Willie Jock speaking. 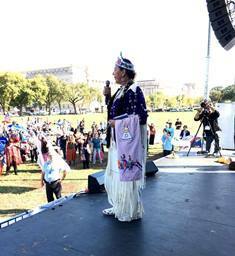 4) Gabe Medicine Eagle speaking at All Tribes DC Rally in Denver on Saturday. 5) Rita Bear Gray of the Cree Nation. 6) The Nations leading worship. 7) Steve Rees. About the writer: Steve Rees is a freelance writer who loves the Rocky Mountains of Colorado, calls Longmont his home, and attends Rez.Church. He can be contacted by e-mail at: steverees@peoplepc.com.